The novel opens with five passengers and a dog navigating a storm in a balloon. The balloon eventually falls on a sandy beach, but one passenger and the dog are missing. It is revealed that the passengers were prisoners of the South in the American Civil War, and had escaped from Richmond, Virginia. Three of the passengers were Captain Cyrus Harding, an engineer; Gideon Spilett, a reporter for the New York Herald; and Harding’s servant, Neb, a freedman. W01_SC Verne’s text is littered with quantitative depictions of the balloon’s erratic descent. Wanting to emphasize the cadence of falling, I graphed the balloon’s decline by distance (y-axis) over time (x-axis). The fluctuation of the red data points indicate wavering positions of the craft, allowing the viewer to observe the magnitude of each drop. The diagram also showcases the adverse circumstances of tragedy and salvation that befall the castaways. As the balloon finally descends onto land, their brave leader falls off board, seemingly lost to the recesses of the ocean. W01_BT Our initiation to the novel was very straightforward – Jules Verne began with a very descriptive and detailed account of how the balloon carried the castaways across the ocean and eventually crashed on the island. There wasn’t any question about the subject matter of the diagram. I chose to do my first diagram by hand, because it just seemed easier to use the existing squares on graph paper to plot everything. Perhaps I also wanted to make a statement: that I was digesting information in a way that was instinctive, organic, much like drawing. It was the pressure that I put on myself to set myself apart – to be the “artist” of the two of us (ironically, it is a label I otherwise tend to avoid). The other two passengers are introduced – Pencroft, a sailor, and his ward, fifteen-year-old Herbert. It is revealed that the balloon was originally meant for use by Southern forces, but the five passengers, and a dog, Top, escaped in it one stormy night. Spilett, Herbert, Pencroft, and Neb find themselves on an islet; Neb swims across the channel to land in an attempt to find the missing Harding. 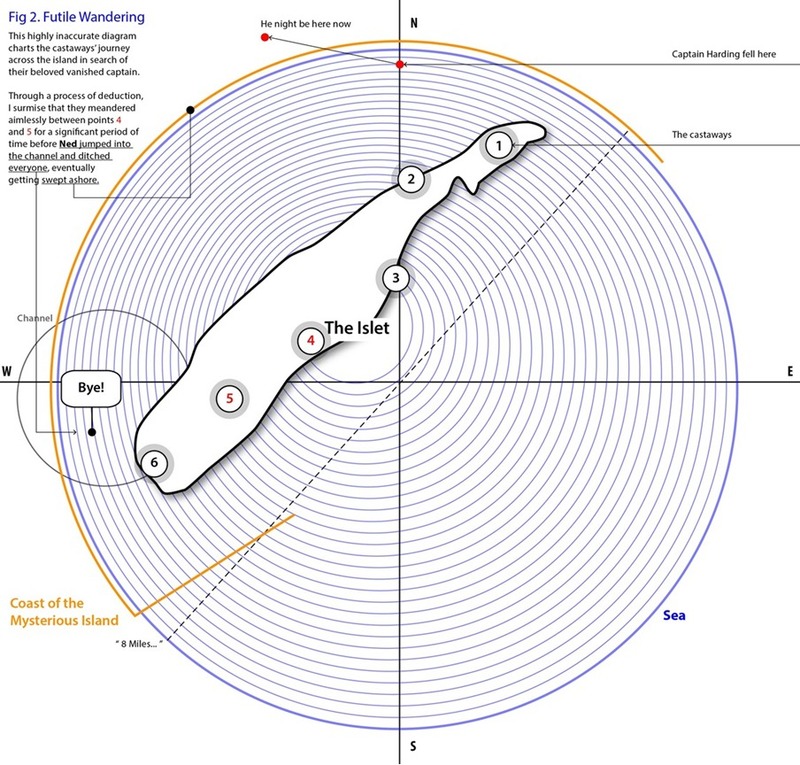 W02_SC Week 2’s diagram, titled Futile Wandering, is a petulant dig at my tenuous engagement with the text. 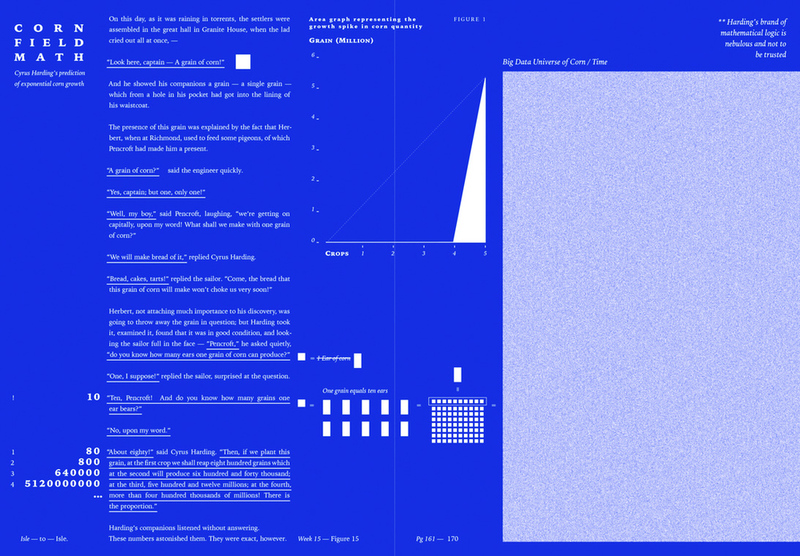 I began the project with the assumption that quantitative precision denotes a correct display of information, and so the limitations of specificity within the text was a burgeoning source of frustration for me. Initially, I was disappointed by my failure to deliver ‘accuracy’ of representation, which I considered to be a designer’s responsibility. I ultimately crafted my visualization by yielding to a process of deduction and imagination, deciding that there was a difference between being quantitatively correct (design accuracy) and qualitatively correct (design authenticity – honoring the “spirit” of the information, or of one’s perspective). W02_BT This diagram is probably one of my least favorite because it feels amateurish – I felt that my control of the vector illustration wasn’t elegant, the gradient effect wasn’t well utilized, and the composition isn’t balanced. I wonder now if the unfinished quality had to do with the amount of uncertainty surrounding Verne’s hard-to-follow description. Maybe my failure this week informed how I generally shied away from cartography throughout the project, even though the novel was filled with geographical detail. Interestingly, Sher and I not only represented the information with different styles, but interpreted it in different ways; our maps hardly look alike. Spilett, Herbert, and Pencroft make their way to the coast. Herbert’s interest in natural history helps them identify food sources. They find a water source, discover shelter nested within rock formations called Chimneys, and collect firewood. Herbert and Pencroft attempt to start a fire, but Pencroft realizes that he has lost the copper box that stored his matches. W03_SC Verne’s novels are often constructed with pseudo-scientific logic. Therefore, trying to stay true to the story’s modes of quantification can be a pointless endeavor. Mathematical inconsistencies on the author’s part made aspects of the novel tough to visualize. I departed entirely from showing data from the story and instead mapped the surface area of the page that the printed word inhabits. Deferring to the physical qualities of the printed artifact as a driving concept for my design, I took the liberty of charting the expanse of typographical content, as opposed to expressing the literary narrative. W03_BT This was the first time I seized on a specific moment in the book. The section that I chose was only one paragraph long, while Sher zoomed out completely to look at the ten pages as a whole. The description of the structure’s resemblance to the ampersand was systematic but ultimately confusing; I still can’t visualize what the setting might have looked like in reality, even after completing the diagram. That is to say, the diagram stays merely on the surface of this typographical simile without illuminating the content of the novel. Neb and Spilett return without Harding. Pencroft finds a match hidden in the lining of his waistcoat, and they successfully start a fire and cook eggs for supper. The castaways note that they have little resources. Herbert and Pencroft go into the forest to hunt. W04_BT Throughout the project, I sometimes found that I could become particularly invested in an idea, but struggle for days with the diagram (partly because I wanted to get it just right). This was the first of those struggles. The idea grew out of empathising with the characters’ needs, something that I tended towards as a reader. While the final design was aesthetically pleasing, I felt that it reduced the desperation that the characters’ felt to mere lines and bars. That is, it accurately represented the data set, but not the emotional quality. Herbert and Pencroft manage to trap a few birds. They return to the Chimneys to find that Neb has not returned from that day’s search for Harding; a storm begins, and they start to worry. Then, miraculously, Top finds them, and leads them to a cave where Neb is kneeling beside the unconscious Harding. Spilett wets Harding’s lips, which is enough to revive him a little. W05_SC Week 5’s diagram is an attempt to devise a new system of representation for time. I plotted time on a grid, with respective hours positioned at the endpoints of a triad of overlapping horizontal and vertical lines. Events are then placed adjacent to the timings at which they occur – a.m. on the inner ring and p.m. on the outer. The data points are plotted along an inverse spiral; parts of the narrative are labelled alphabetically to indicate their sequence. The execution of this diagram is possible due to the finite nature of the information. However, I am not confident that it would be viable with a larger data set. W05_BT Disappointed in the austerity of the previous week’s design, I played with gradients and stronger colors this week to convey the palpable sense of anxiety in this part of the novel (the gradients were something I had tried for Week 4, but I couldn’t figure it out then). Nevertheless, my reliance on linearity to construct my systems was already starting to bother me, especially when I saw Sher’s diagrams, which were much more experimental structurally. Neb recounts how he found Harding in a cave after spotting footprints on the beach. The castaways build a litter to carry Harding back to the Chimneys. Harding, now strong enough to speak, has no memory of how he arrived at the cave. Upon return, they find that the Chimneys wrecked by the storm, and the fire extinguished. Unable to restart the fire, they wait for Harding to recover, believing that he, “possessor of all human knowledge,” will have the solution. W06_SC This diagram is visually inspired by Ben-Day dots that I observed in the work of Sigmar Polke at an exhibition at the Museum of Modern Art (MoMA). However, this stylistic treatment strays completely from the aesthetic of Ben-Day dots, as I applied a half-tone overlay that is not of equal size or distribution. The diagram highlights the events leading up to of how Cyrus Harding’s body mysteriously ended up washed up on shore. Flanking the bottom of the diagram is an excerpt of the text. The annotated quotes denote the movement and location of the captain’s body; it was important to me to include this and showcase the relationship between the information source and the end product. W06_BT I reverted to color pencil on graph paper, revealing my tendency to jump from style to style with no consideration for aesthetic consistency. Like Week 3, I focused on something quite specific – the way the other castaways treated Harding like a beacon of hope. Indeed, I picked up on his messianic role, but wasn’t able to see as many Biblical references as Sher did in Week 7. This was the first time that I created something that wasn’t strictly a diagram, instead relying on the inherent diagrammatic implications of graph paper to buoy my illustration. Harding wishes to climb the mountain to ascertain if they are on an island or a continent. Pencroft, Herbert, and Neb kill a capybara, and when they return to the Chimneys, they find that Harding has successfully lit a fire. The castaways begin their arduous expedition up the mountain, hunting as they go. W07_SC As I had a strict Christian upbringing, I was particularly sensitive to Biblical references in the novel, such as the portrayal of Cyrus Harding as a messiah figure. I define four touchstones for what constitutes a messianic archetype – 1) gospel/wisdom, 2) disciples/followers, 3) miracle, 4) resurrection – based off biblical teachings sifted from my childhood. The information is displayed in a simple flowchart, with each categorization extending to accommodate supporting evidence. W07_BT In this week’s ten pages, I focused on a very simple aspect: the intention to climb and actual climbing of the mountain on the island. This might be seen as a precursor to later diagrams that picked out one tiny but consistent aspect over the ten pages, and then abstracted it. However, I was again frustrated that I couldn’t tease out something more sophisticated; I really loved Sher’s exploration of Biblical references, and made it a point to go deeper into the text. Harding realizes that the mountain is an extinct volcano. They reach the summit, and discover at first daylight that they are indeed on an island. They survey the island, determining that it is likely uninhabited. The castaways declare themselves “colonists” as they begin to assign names inspired by America to the island’s various geographical features. W08_SC As the castaways continued to explore the land and unearth its bountiful reserves, I began to envision a growing image of the mysterious island, culled from Verne’s sprawling descriptions of the characters’ experiences and dialogue. As the information set is constrained to ten pages, data from earlier weeks is insufficient to construct a fully realized diagram. However, as the story progresses, the impulse becomes a compelling need. It is only at week 8 that I finally amass enough information to pursue this undertaking. Ironically, although the final diagram resembles a map, it is a complete figment of my imagination and riddled with discrepancies. The diagram appears more like a world map from a video game than a real delineation of territory. It then dawns on me that I am expending too much energy worrying about visualizing a fictional island accurately. W08_BT This is still one of my favorite diagrams, because I felt like I was digging something latent out from inside the text. I was especially disturbed by the castaways’ motivation to declare themselves colonists, though I suppose this is an unsurprising inclination for the 19th century. I used the idea of an outline – something that defines a shape that might otherwise be formless – as a metaphor for the concept of power. After all, defining, knowing, and naming are means of exerting control. I know that Sher didn’t like her diagram this week, but I did, and I appreciated that she was experimenting with an aesthetic outside of her comfort zone. The island is named Lincoln Island after Abraham Lincoln. The settlers descend the mountain (Mount Franklin), finding a sulphur spring and a large stream as well as identifying flora and fauna along the way. They find a lake, named Lake Grant, on their way back to the Chimneys. Harding announces that they will begin exploiting the island’s natural resources in order to establish a home. 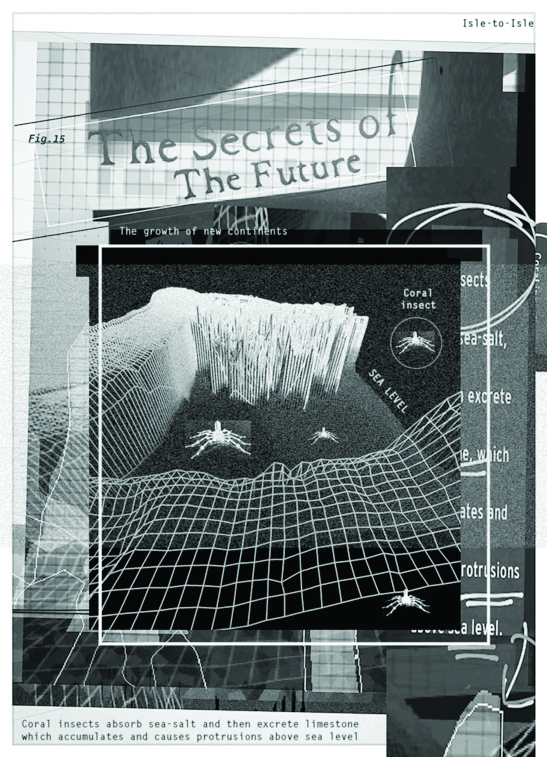 W09_SC Although fantastical in nature, Verne’s stories are dense with empirical detail. This could perhaps be an attempt to root the stories in realism. However, when a list of every available resource of the island spans the entirety of the ten pages, I was almost bored to tears with the mundanity of the prose. I tallied up all the mentions of indigenous flora and fauna and represent my findings in a mock periodic table of elements. W09_BT One unintended effect of Verne’s pseudo-scientific writing is inaccuracy, though we can’t tell if it’s because the scientific knowledge available at the time was inaccurate/incomplete, or because he misinterpreted that information, or because he was able to make something sound descriptive without actually describing the object in an illuminating way. Regardless, I decided to highlight one of Verne’s inaccurate descriptions of animals this week, in one of the few diagrams in which I use photographic elements. The settlers construct a kiln to produce pottery for cooking. They also craft knives and bows and arrows for hunting. Harding comes up with a means of determining their approximate geographical location. W10_SC Despite being stranded on an island, the castaways make strides in improving their situation through perseverance and teamwork. I devised a simple rubric to plot their chain of success over time. A circle is a visual indicator for an event completed, while a semi-circle (being incomplete) is used to denote an event in progress. The process of overcoming an obstacle is represented by a dashed line connecting the half circle to a whole. Circumstantial triumph is indicated by the color yellow (I chose a vibrant hue to denote a sense of achievement). In the greater scheme of things, I consider Berny’s and my capacity for eking out a diagram a week, a kind of small victory as well. Harding determines that the island is situated at 35–37°S, 150–155°W, too far from any known inhabited land for them to bother building a boat and sailing there. The settlers begin processing iron ore in order to manufacture tools. W11_BT One would think that the focus on calculating the latitude and longitude of the island would be an opportunity for some interesting cartography. Instead, I simply plugged the coordinates into Google Maps and took a screenshot, then added some other details mentioned in the novel. This created a humorous juxtaposition between Harding’s painstaking analog method of determining their location, and my own straightforward digital method. Since I deliberately (rather than reluctantly) took a shortcut for this diagram, I didn’t end up comparing it unfavorably to Sher’s. I loved that she once again explored the novel’s metaphorical dimensions. The settlers manage to manufacture iron and steel tools. They set about locating a better shelter for the winter months. They encounter a lake, where Top is attacked by a dugong. However, Top is thrown from the water by a mysterious amphibious creature and manages to get to shore; the creature battles the dugong and kills it. W12_BT This week’s ten pages was characterized by paranoia and the identification of threats to the characters’ safety. I avoided illustrating any of the threats, and instead reduced them to blocks, choosing colors that roughly corresponded to the nature of the threat (for example, “cold” was an icy blue, while “Malay pirates” were represented by a deep navy, much like the ocean). What bothered me was that this over-abstraction made it difficult for someone to look at the diagram and instinctively understand the nature of the threats. The blocks and their colors were merely ornamental rather than truly symbolic. Harding declares that they should blow up part of an area called Prospect Heights in order to drain the lake waters that are preventing access to a cavity in the granite, where they might find a new location to establish their base. The settlers spend the next couple of weeks manufacturing explosives. After the explosion, they journey into a hole that has opened up in the granite. 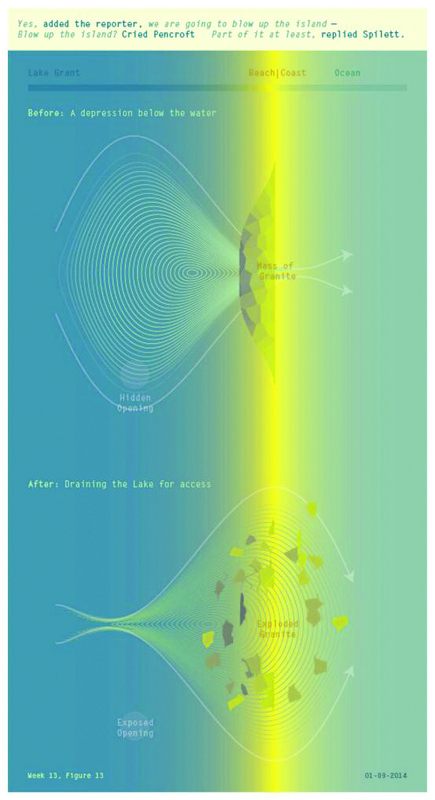 W13_SC This week, I utilized basic graphicacy to illustrate the draining of the waters by creating a shape for the lake that delineates from wide to narrow. The pinched end represents the area where the flow of water is obstructed by the granite. To indicate the outcome of the explosion, I flipped the shape horizontally to demonstrate the outflow of water. W13_BT Sher and I focused on a similar topic this week, and while hers was illustrative, I chose to concentrate on the predilection of these (white) Americancharacters for blowing stuff up. I was struck by the contrast between the amount of tiresome work the castaways put into creating the explosives – a process that occupied the majority of the pages – and the abrupt, immense nature of the explosion. For such a basic idea, I took a very long time to tweak this diagram such that the text represented by the negative space could be legible. A vast cavern is found and deemed suitable for their new base. It is named Granite House, and they plan to divide the space into five compartments. Top barks suspiciously at a well at the edge of the cavern. The settlers find that one wall of the cavern faces the sea, and construct a ladder so they can establish a new entrance there. W14_SC For this week’s diagram, gradients serve as a barometer for denoting ranges of emotion. White is used to express positive sentiment, and black for negative. I decide not to use fixed quantities as means of representation due to the mutable nature of emotion. The morale of the castaways hinges upon the stability of their leader Cyrus Harding. Aware of “how communicable confidence is,” he puts on a bold front so as not to distress his companions. However, the diagram suggests that he is repressing his anxieties about the future, so as not to incite panic. My reasoning for the absence of darkness in Top’s bar is by virtue of the fact that he is an animal, incapable of feeling complex emotion. 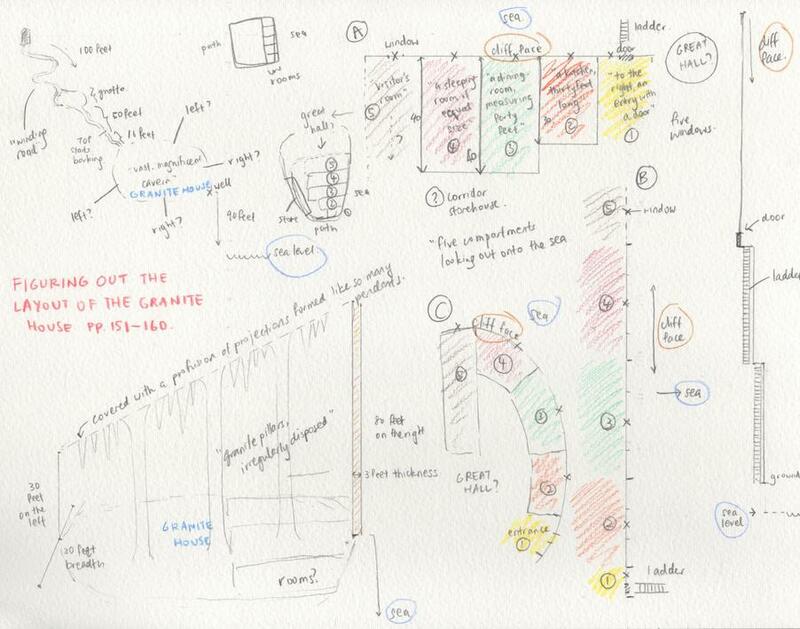 W14_BT Verne’s confusing descriptions struck again, so I decided to use my diagram to mirror my own confusion in trying to figure out the interior of the cavern that the characters discovered. I didn’t see a point in creating a finished-looking diagram, so I just sketched with pencil and color pencil. Comprising a few mini-diagrams and a lot of question marks, I had hoped that it would help me visualize the cavern, but it only perplexed me even more. W15_SC In week 15, Berny and I poke fun at the Captain’s questionable brand of mathematical logic by visualizing his theory of projected crop growth from a single grain of corn. I started by underlining instances in the text where numeric values are mentioned. 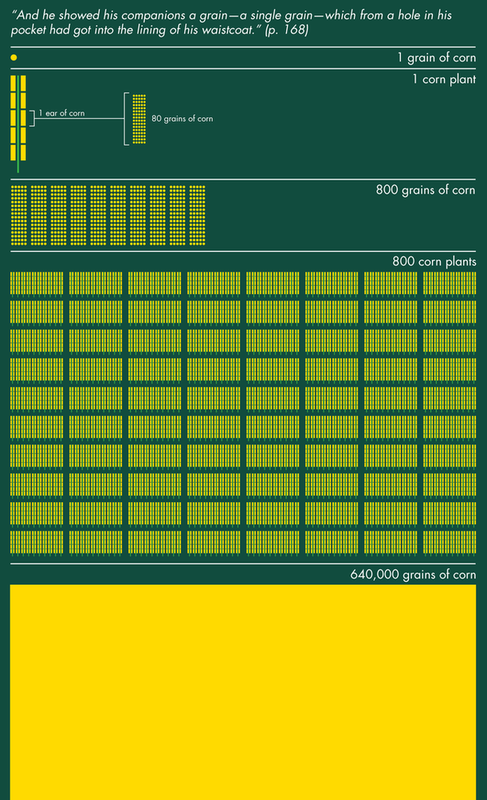 The diagram illustrates how one grain of corn accumulates to infinity over time – I represented the immeasurability of the predicted output with the image of noise. W15_BT I love that we chose the same subject matter this week, and this pairing of diagrams truly shows our differing digital aesthetics. I personally favor flat planes of color, minimal text, and straightforward compositions, perhaps because I’ve never been formally trained in design and I like to keep things simple. Sher’s liberal use of text, however, encouraged me to integrate more text in my subsequent diagrams. I also remember being struck by the almost unbelievable luck of the castaways – to think that one of them found this grain of corn, and that the grain would grow healthily and yield hundreds of thousands of grains! The settlers decide to venture into an unknown part of the island. Harding explains his theory that the Earth will gradually become colder until it dies. They build animal traps, using fox carcasses as bait. A snowstorm descends, and they stay within Granite House, furnishing the interiors. illusive model. The collage aesthetic is meant to emphasize the fictitious nature of this conjecture. W16_BT This was just one of those weeks when I decided to spend an inordinate amount of time on the project. I had wanted to use thread/embroidery for some time, having previously combined the medium with the diagrammatic aesthetic in my own art practice. Since I could come up with a fairly simple system for Harding’s inaccurate “global cooling” theory, I decided to stitch lines and crosses into paper. This was one of my most well-received diagrams on social media. I enjoyed Sher’s contribution this week because it was much looser, and more concerned about her own interpretation of the information than the information itself. The Granite House continues to shelter them from the harsh winter. Harding wonders why Top persists in barking at the well in the cavern. The settlers feast, but as Pencroft chews the meat of a peccary (a type of pig), his bites into a bullet and breaks his tooth. W17_SC Inspired by a book titled Speculative Drawing that I purchased at the New York Art Book Fair, my diagram is a collection of hand sketches that illustrate the possibilities of what lurked within the confines of the dark well in Granite House. I ceded to this analog mode of exploration to liberate myself from a habit of self-censorship which I felt was impeding my creative process. I let my imagination run free, deliberating on potential scenarios as I pondered the contents of the well. The eventual output is a riposte to the often overtly pedagogical language of diagrams. In exempting myself of a self-imposed stipulation of specificity, I am able to use my design as a speculative tool for illuminating new perspectives within the text. W17_BT I felt like Sher and I had a role reversal this week – she incorporated drawing into her work for the first time, while I stuck with digital illustration. I wasn’t very happy with my diagram; again, I encountered the issue of not being able to convey the emotional quality that I felt in the novel (in this case, the excitement that culminated in the end of Part I of the novel). I think that my color scheme in particular could have done more to either draw the parallel between cliffhangers and cliff structures, or convey anxiety.